The plan for today was to fish in the morning and afternoon. Mid day we were on the roster to help with a kids clinic put on by Vermont Sportsman Hardwater Tournament Series. The bite recently had been decent but with the way Lake Champlain has been this winter, nothing was certain. We got on the ice early to try to find fish for when the kids showed up. Because of the recent trend in weather, we didn’t have to punch any new holes in the morning. The past few days were busy enough and the fish were already semi-located. As we worked through the vast expanse of holes, we found small pockets of fish but no big pods. As the time grew closer to the time that the kids started showing up, so did the fish. 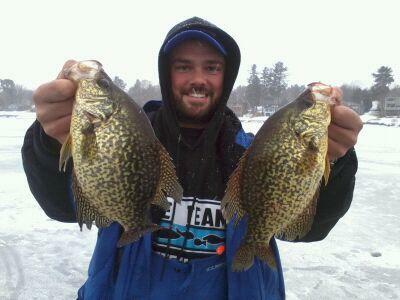 The pumpkinseed were running large, the bluegill small, the perch thick and the crappie thin. Throughout the day the bite was steady. 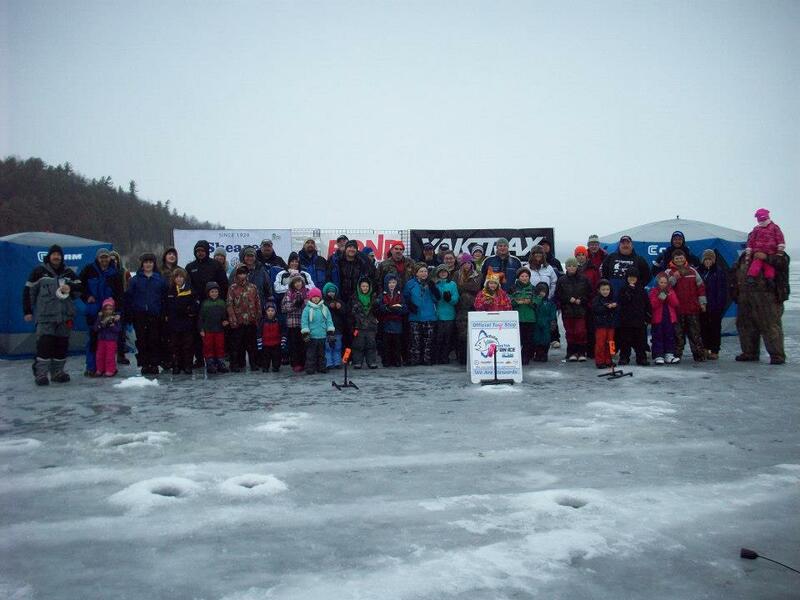 After a brief introduction on ice fishing from Clam pro-staffer James Vladyka, the kids were sent out for more one-on-one teaching. In this session, we taught the kids how to read a flasher, various jigging techniques, and if they were lucky enough, fish identification. The last part of this event was a pizza and prizes ceremony. We had pizza donated from Big Daddy’s Pizza of Burlington and among various clam products and rods, there was a Vermont lifetime license give away. After the event wrapped up and the spread was loaded back into the trailer, we got to fishing. For the remainder of the day, we located and caught fish on the move. We worked to the end of a 10 foot weed bed where we found a school of constantly roaming crappie. They were working back and forth below us and we picked at them when they came by. It seemed like every time we punched holes the fish turned on both the new holes and old ones. At the end of the day, we all had a nice spread of fish for the table. It’s always great sharing the ice with guys who have passion and want to promote the future of our sport!